Asteroids are large irregular chunks of rock that can be found in many places throughout New Eden. 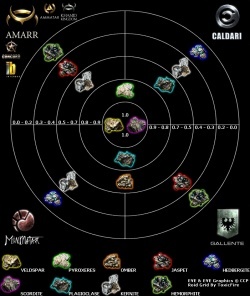 When mined, asteroids yield ore which, when refined, produces minerals of various types that serve as the basic building blocks of almost every craftable item. An asteroid belt. The ship in the middle is sitting at the warp-in point. 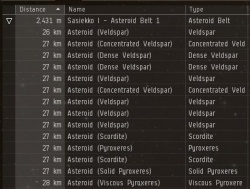 Virtually every star system in EVE (with the notable exception of Jita) has at least one asteroid belt. Most star systems have several -- up to more than a dozen in some cases. These belts are listed on the overview and the right-click menu, and always have the same geometry: a rough semicircle of asteroids, approximately 50 km in diameter. A ship warping to an asteroid belt's beacon (through the right-click menu or the overview) will warp to the center of the semicircle. Note that mining lasers have an (unboosted) range of only 10-15 km, so in order to mine asteroids a ship has to fly closer to the belt after warping in. If you want to save on travel time, you can warp to mining bookmarks instead. 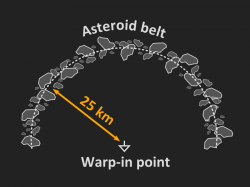 A given belt will have a mixture of asteroids containing different ores. The mixture and size of the asteroids (i.e. how much ore each asteroid contains) is determined by the system's location in the EVE universe and its security status (see asteroid distribution below). Each asteroid belt contains a finite number of asteroids (which disappear once fully mined), but the asteroids respawn after downtime. The website Dotlan has maps showing the number of belts per system. Mineable asteroids can also spawn in deadspace pockets, such as the ones created for missions. Unlike asteroid belts, these are not organized into a set shape. Some are composed of dense clumps of asteroids, while others are scattered fields. For a list of which missions' deadspace pockets contain asteroids, see Mission Mining or EVE-survival. Lastly, one of the two kinds of cosmic anomaly contains asteroids (the others contains hostile rats). The asteroids in cosmic anomalies tend to be a little larger and contain rarer ore than the normal asteroid belts in a star system. However, unlike asteroid belts, once all the asteroids in the anomaly have been mined, the anomaly disappears after broadcasting a short message in Local. As with all cosmic anomalies, new anomalies spawn semi-randomly. Note that in many locations you will find decorative asteroids, which cannot be mined or otherwise interacted with. These will have colorful names such as "Snake-shaped Asteroid". There are different types of asteroid cosmic anomalies, named by what kinds of ores are contained within. Each type comes in three variants (small, average, and large) - the "larger" the anomaly, the more asteroids (and hence the more ore) it contains. A "Small Kernite and Omber Deposit" therefore contains a small number of Kernite and Omber asteroids, while a "Large Bistot Deposit" contains a large number of Bistot asteroids. Ore anomalies will contain all three variants of the ores they contain. 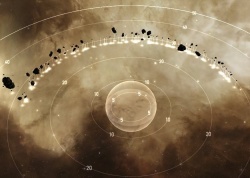 In player-owned sovereign nullsec, it is possible to deploy Ore Prospecting Arrays, a deployable sovereignty structure which, when deployed in a system, periodically generates asteroid clusters of various sizes at set intervals. All sizes of asteroid clusters are capable of spawning regardless of system security status, and all clusters of a given size contain the same volume of ore, but asteroid clusters in lower security levels will spawn the more valuable ore variants with greater frequency. With the exception of Small Asteroid Clusters (which lack Mercoxit), all clusters contain varying amounts of all nullsec ore types: Arkonor, Bistot, Crokite, Dark Ochre, Gneiss, Spodumain, and Mercoxit. An asteroid belt, as seen on the overview. Note the belt's warp-in point (marked with an inverted triangle), as well as the variety of different asteroid types (all labelled according to what kind of ore they contain). For the distribution of ice asteroids, see Ice distribution. Each of these four quarters has its own set of asteroid types. Additionally, the lower the security rating of a system, the rarer the asteroid types that can be found there. Finally, each system can also include all the asteroid types of same-quarter higher-security systems. For example, a Gallente system with a security rating of 0.7 will have asteroid belts with not only Omber asteroids, but also Veldspar, Scordite, and Plagioclase asteroids. Null security space is not as clearly defined as high security due to being player owned. Instead it is easiest to classify it by Security Class, which is most easily viewed via sites like Dotlan by using the Security Class filter on a map. Note that, going down each column, all ores present in the class above also spawn. For instance, "J" systems spawn Veldspar, Scordite, Pyroxeres, Plagioclase, and Jaspet. "J1" systems have all of those, plus Dark Ochre. "J2" systems have everything in "J1" systems, plus Crokite, and so on. In general, the rarer the ore, the higher its volume per unit (e.g. one unit of Veldspar has a volume of 0.1 m3, whereas one unit of Arkonor has a volume of 16 m3). Since mining lasers mine a given volume of ore per minute, it takes longer to mine the rarer ore types. Additionally, each ore reprocesses into a different set of minerals. For details, see Reprocessing. Note that mining Mercoxit requires the Deep Core Mining skill as well as special mining modules (Deep Core Miners or Deep Core Strip Miners). All other ore types can be mined with all types of ore mining lasers or strip miners. Each asteroid type has three further subtypes that yield more (+5% / +10% / +15%) minerals when reprocessed. Otherwise they are identical in every way to their base ore, and are found in the same regions, but in lower quantities, except for the +15% variant which is only found in moons. For instance, if an asteroid belt has Omber asteroids, it will also have some Silvery Omber asteroids and a few Golden Omber asteroids. If you get the chance, you should always mine the higher-yield variants before mining the base ore.
1234 Green backgrounds indicate the best value per m3 for that mineral. ^ a b Batch size is the minimal amount of ore you need for reprocessing. All values in the table (with the exception of volume) are based on one full batch. ^ a b The column contains the quarter of EVE universe and the maximum system security in which the ore can be found; the ore can be found in that solar system in that quarter with that system security or lower. This page was last modified on 20 July 2018, at 14:33. This page has been accessed 542,705 times.